Award-winning artist Gayel Childress works in watercolors as well as oils and monoprints. She is best known for her fluid interpretations of landscapes and figures that capture the essence of the moment with a superb touch of humor. Childress, who has studied with William Wright, Jan Kuntz, Robert E. Wood and Don Andrews, has shown her work in many one-artist shows and art exhibitions. Her paintings can be found in numerous private and corporate collections throughout the United States and Europe. Her contributions to the art community within the Ojai Valley have been monumental. 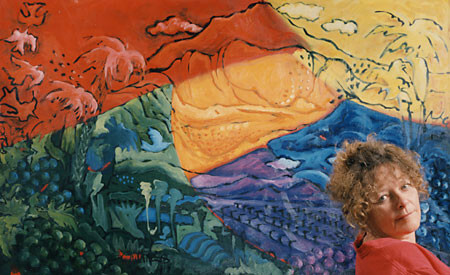 She, along with Marta Nelson and Bert Collins, founded the Ojai Studio Artist’s Tour in the late 1980s. The results have been thousands of dollars contributed to arts education as well as tremendous economic vitality to the Ojai Studio Artists and the community of Ojai. In addition, these three women have been instrumental to the success of the Ojai Art Center, helping to shape its future for generations to come. Gayel creates her work within her gallery and frame shop located in Ojai. Gayel Childress’ documentation took place in 1997 and 2002. The FOTM Archive contains extensive information about this artist.